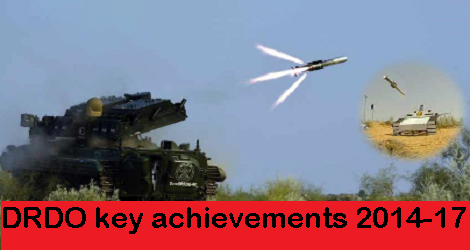 Some of the notable successful tests completed and inducted are Tejas fighters, Airborne Early Warning and Control System (AEW&C) System, Akash Weapon System, SONAR systems, Varunastra Torpedo, Bharani Weapon Locating Radar (WLR), Nuclear Biological Chemical (NBC) Recce Vehicle, AGNI-V, Long Range Surface to Air Missile (LRSAM), Medium Range Surface to Air Missile (MRSAM), NAG, Advanced Towed Array Gun (ATAG), Wheeled Armoured platform (WhAP), RUSTOM-II MALE Unmanned Aerial Vehicle, etc. New Delhi 13 May 2017: The Defence Minister Shri Arun Jaitley unveiled a compilation of the contribution of the Defence Research & Development Organisation (DRDO) to the Indian Armed and Paramilitary Forces here today. The DRDO Chairman and Secretary, Department of Defence R&D Dr. S Christopher, Chief of the Army Staff General Bipin Rawat, Vice Chief of the Naval Staff Vice Admiral Karambir Singh, Vice Chief of the Air Staff Air Marshal S B Deo and other senior officials of the Ministry of Defence & the DRDO were also present on the occasion of the release of the “DRDO Key Achievements 2014-17” compilation. Defence Minister Unveils ‘DRDO key achievements 2014-17’ successful tests completed and inducted are Tejas fighters, Airborne Early Warning and Control System (AEW&C) System, Akash Weapon System, SONAR systems, Varunastra Torpedo, Bharani Weapon Locating Radar (WLR), Nuclear Biological Chemical (NBC) Recce Vehicle, AGNI-V, Long Range Surface to Air Missile (LRSAM), Medium Range Surface to Air Missile (MRSAM), NAG, Advanced Towed Array Gun (ATAG), Wheeled Armoured platform (WhAP), RUSTOM-II MALE Unmanned Aerial Vehicle, etc.